For a second consecutive match, a slow-starting Canada team gradually asserted its dominance and won by 3 clear goals, this time a 3-0 decision against Puerto Rico in a steamy Bayamon. 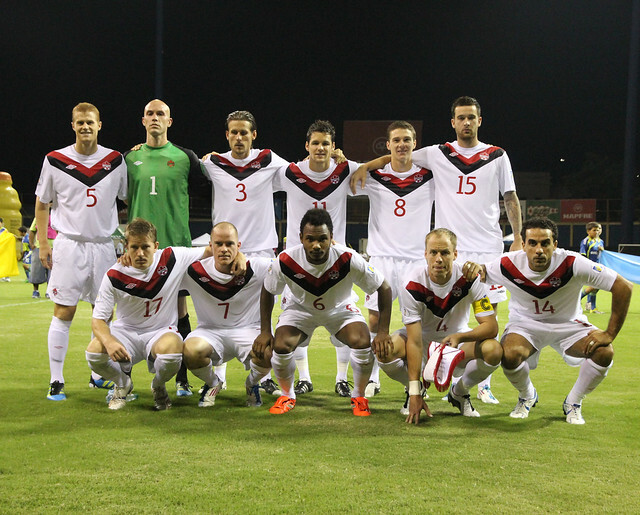 This photo of the starting eleven is a good place to start. There were four changes to the group that started against St Lucia. One of those changes, it would seem, was a forced move due to injury: Atiba Hutchinson, Canada's best player on Friday, sat out with a sore knee. Terry Dunfield drew in to replace him. Unsurprisingly the diminutive but enthusiastic ball-winner earned a first half yellow card and a precautionary second half substitution. Whether Hart was disappointed in the play of fullbacks Ante Jazic and Jonathan Beaulieu-Bourgault against St Lucia, or he was saving Mike Klukowski and David Edgar for the more difficult opponent, or (most likely) both, there was a clear upgrade in defensive wing play. Simeon Jackson was wasteful of his chances against St Lucia, and was rewarded with a spot on the bench. Canada's formation did not match that of the previous game, but Will Johnson was the man who took up the extra spot and played a strong match in midfield. Only Dunfield, of the 4 new starters, did not play a good (or better) match. In retrospect, perhaps the biggest difference between last night and Friday vs St Lucia was that the long-distance strike in the first 10 minutes was saved by Hirschfeld (though the replay showed it probably would have gone wide or onto the post) instead of going in. While Puerto Rico created the most chances in the early going, and enjoyed a succession of corner kicks, there were few serious threats apart from the rangy effort from Delgado. Still, it was a lackluster-looking effort from Canada for the first 30 minutes. There were few forward thrusts into the final third, and those times when they did get forward the usual result was a wayward shot from distance, leading a characteristically sour Gerry Dobson to wail "Oh, the finishing!" But Puerto Rico was doing far too much running with greatly diminishing returns. For the last 15 minutes of the 1st half Canada dominated possession -- if you believe Iain Hume they held 85% of the ball during that stretch -- and the chances too. And in the 42nd minute when a Mike Klukowski cross was only partially cleared, Hume coolly slotted home for a 1-0 lead. The second half featured more of the same. Canada continued to control the ball with both Klukowski and David Edgar getting forward to good effect. The latter was somewhat surprising, given that he is more accustomed to lining up in the centre of the defense. Still, the most dangerous chance in the first half of the period was a Puerto Rico header wide after Edgar naively misplayed a bouncing ball and let his man go free and launch a cross. Stephen Hart made two substitutions in the half. The first, around 65 minutes, when he brought in Simeon Jackson for Dunfield, who was on a yellow. As a result, Dwayne De Rosario dropped a bit further into midfield (he had been playing up top with Hume) and Will Johnson played more centrally, though he was all over the pitch the whole night (in a good way). Jackson provided a spark, but the biggest play of the half came after De Rosario was fouled just outside the 18. A number of players stood over the ball, but surely all the Voyageurs expected De Ro to hit it. But a few touches were quickly worked to David Edgar, of all people, who struck a good ball that was only parried, and Jackson clinically deposited the rebound. De Rosario, according to some, was not happy. The goal came just moments after Josh Simpson was replaced by Tosaint Ricketts, and the latter was the beneficiary of some good ball movement and tired Puerto Rico defending, putting Jackson's pass into the back of the next just before the final whistle. All goals can be viewed here. Though the commentary from Gerry Dobson and Craig Forrest dwelled on the negative, this was a more positive performance than Friday's effort against St Lucia. Though Puerto Rico is not a great team by any stretch of the imagination, they were organized and tactically disciplined. Like Stephen Hart, I viewed this match as Canada's toughest test, and the team escaped unscathed with a relatively workmanlike three goal win. Add to that the fact that they did it without their best player (Hutchinson) under hot and humid conditions and you have the makings of a classic road win. The problems were much the same as against St Lucia, though less glaring: turning a big possession advantage into chances, and turning those chances into goals, as well as a few worrying moments when strikers found space in the middle of Canada's defense. Nothing, though, that can't be fixed, or at least so one would hope. Canada is top of the group with 6 points (St Kitts is second with 4 after defeating St Lucia away 4-2), which is no less than anyone should have expected. Lars Hirschfeld - 7: He made the one save that he needed to early, and otherwise looked comfortable. David Edgar - 7: This would have been an 8, if not for a misplay that almost led to a Puerto Rico goal. I was surprised at how comfortable and how useful he was getting forward. Kevin McKenna - 6.5: Craig Forrest called him the man of the match, but on more than one occasion a Puerto Rico forward had a free header close to goal. Andre Hainault - 6.5: See above. Mike Klukowski - 6.5: He is clearly shaking off the rust due to the strike-delayed start to his Turkish season. He was fine defensively and occasionally got forward to good effect, but too often stalled in attack. Terry Dunfield - 5.5: He is fine against this level of opposition. He knows where to be to stall the opponent's attack, and makes the safe pass. But he is always a danger to be sent off, and lacks the ability to make the decisive pass. Will Johnson - 7.5: At times it was difficult to know where he was positioned because he was involved in the play all over the pitch, including tracking back to make some critical tackles. He really shone once he pushed more into the middle when Dunfield was taken off. Julian de Guzman - 7: His most obvious contribution to the match was a series of shots well over the bar, but this was a more confident and competent de Guzman. Hopefully he is slowly on the rebound from two years of bad form. Dwayne De Rosario - 5.5: The guy goes all game giving up the ball on poor touches, taking the air out of attacks and drifting in and out of the game, and then goes and wins a free kick that ends up in the net. Go figure. Josh Simpson - 6: The Puerto Ricans clearly had done their homework as their right back Rivera largely (and often illegally) marked Josh out of the game. Had one moment where a bit of fancy footwork sent him in on goal, but he lost the ball with a poor final touch. Iain Hume - 7: I think the guy is overrated by the fans because he is an effort player (the old Leafs fan syndrome) but he was full of running and besides his goal was involved some other good buildup play. SUBS - 8: Both Jackson and Ricketts scored a goal, so there's not much to criticize. Here's a stat though (beware of small sample sizes! ): with 2 goals from 6 matches, Ricketts' strike rate of 0.33 goals/game is better than any Canadian not named Gerba. And his 1 goal every 43 minutes (2 goals in 85 minutes total) is off the charts. Of course we're dealing with very little play overall, but for the first time I am considering the possibility that he can be a useful player for Canada instead of just a bit of roster filler. Self-indulgent gambling update: Nobody was more excited about Rickett's late goal than I was. I put money on the over (+/- 2.5 goals) and come out a few Euros richer. De Guzman is certainly a better linking player than Dunfield in that he has more 1 v 1 composure in the defensive third and quicker, tighter control on the ball before he needs to dish it off, whereas Terry needs to be playing the one and two-touch stuff, keep it rolling stuff to be effective. Also, Dunfield doesn't possess the long range passing ability to the flanks that was the underrated hallmark of Nash during the GC 07, able to open up the flanks with an immediate strike: however, that's not really in De Guzman's arsenal, either. I agree that Dunfield is also a card risk with his rash challenges caused in part because his level of quickness doesn't match his level of aggressiveness. I still have concerns about De Guzman's 1 v 1 defending/ballwinning against a quick midfield opponent. I think Dunfield has better playmaking instincts then given credit for: he used an overlapping Edgar effectively for the RB to send over the bar and in the second half he also laid back a ball for a supporting player (not sure who?) to blast a shot into the box. I didn't think De Guzman stood out with his playmaking during the PR match and as the Vs loyola pointed out they both looked to be playing similar roles on the field. In the end, Dunfield's a guy who's athleticism holds him back at this level but his pro experience and geniune/sincere enthusiasm to put on the Maple Leaf makes him a good guy to have in the squad/change room, for now. The team's going to win this group but the jury's out on whether they have the goods to get out of the next round. Once again, it's going to boil down to making sure that we don't sh*t the bed at home vs Honduras and Panama. If the midfield trio of Hutchinson, De Guzman, and Johnson play well, then we'll have a chance. If we get bossed in that area of the field, either home or away, we'll be hooped, but inevitably other fall guys will be found. Soccer: A major sport in Canada?